To the men of the USS Maddox who gave their lives in defense of the United States of America. Eight officers and men and to our former shipmates who have since passed away, we dedicate this website. Armament: 4 x 4"/50, 2 x 1pdr AA (1 x 3"/23AA), 12 x 21" tt. Laid down by Bath Iron Works, Bath ME October 28 1943. Launched March 19 1944 and commissioned June 2 1944. 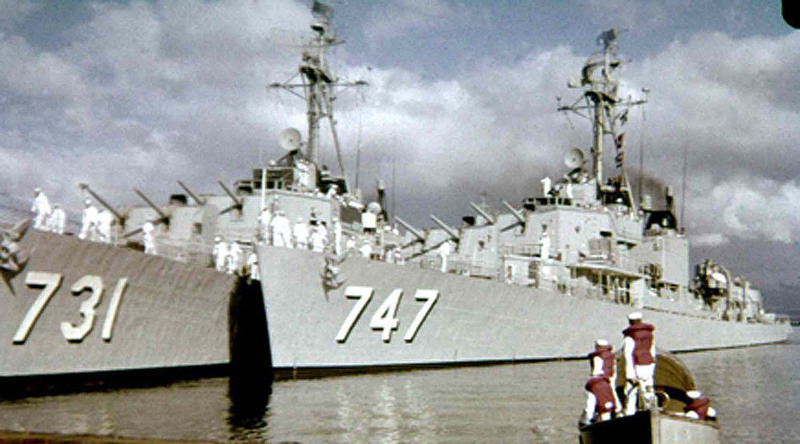 Decommissioned and stricken July 2, 1972. 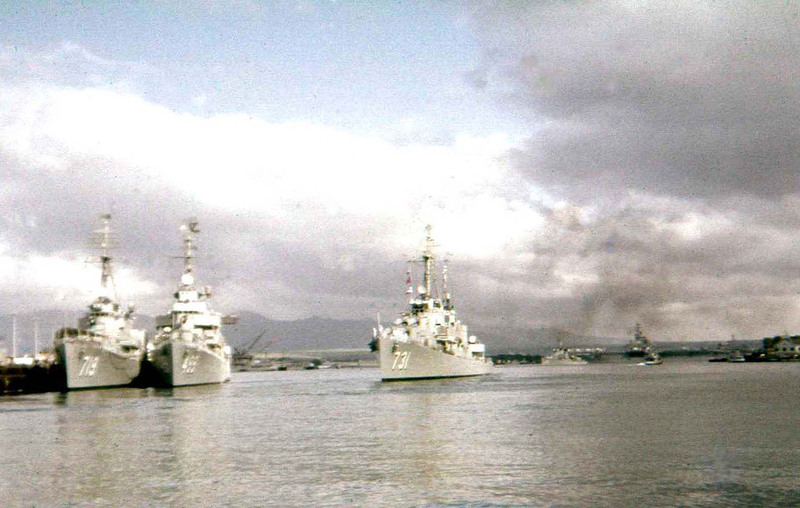 To Taiwan July 6 1972, renamed Po Yang. Stricken in 1985. Fate Transfered to Naval Weapons school and then scraped. I am Eugene Sarsfield’s granddaughter, Jane Vaccaro. My grandfather was the Commanding Officer of the Maddox when she was sunk off Sicily in 1943. I understand that your Maddox reunion will be coming up in just a few days in Philadelphia, and wanted to send you all my best wishes. The men who served on the Maddox with my grandfather, as well as their families, are in my thoughts and prayers always. For those who survived that July day, I hope that life has brought you all the blessings and peace you so richly deserve, along with the knowledge of gratitude that is felt for your own great sacrifices. The Battle of Sicily and the loss of the Maddox occurred generations ago, now. But time has not lessened the sadness of losing so may dedicated and wonderful men, and it has not lessened the emptiness we still feel by their absence in our lives. For you good men, and for the families who gave the greatest sacrifices of son, brother, husband, friend … know, as I do, that their legacies have made a difference to those generations that followed. My own daughter, Jenna, grew up hearing the same stories of my absent grandfather that I did, learning about what a great man he was, and understanding the value of his life, and of the sacrifice made by his family. She calls him “Grandaddy”, just as I did and just as her own children will one day. 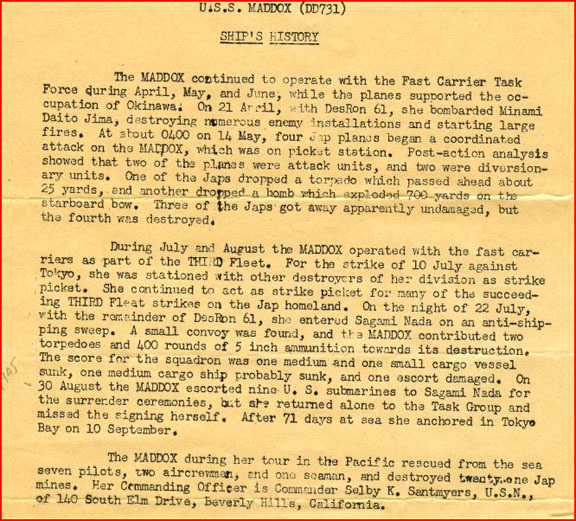 The loss of the Maddox on July 10, 1943 set his life and accomplishments, and the lives and accomplishments of all those who perished with him, in stone. He, and they, will forever be the greatest truth of whom they were. I wish you all, all the best. and found the plaque pictured below, half buried in sand. I'm had it ever since. With the event of Internet I found your website. So the mystery remains: How did this well preserved plaque land on a Jamaican beach sometime before 1968. Any clues??? 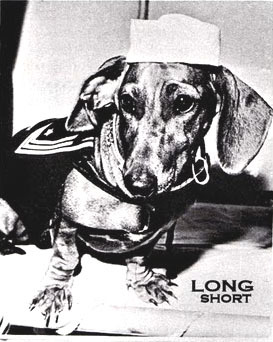 L.B., a Dachshund under a year old, disembarked in June at Long Beach, California. 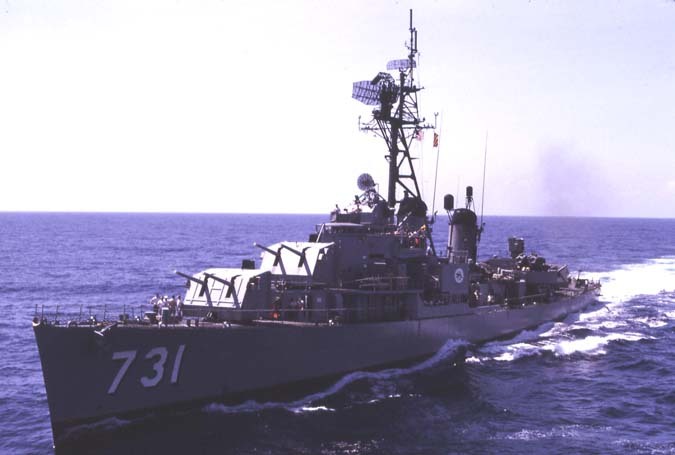 She had been aboard the USS Maddox, a destroyer that ploughed the waters off Vietnam with the 7th Fleet. 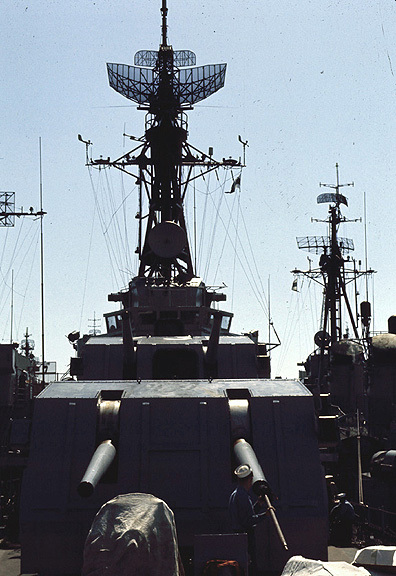 LB was part of the effort to keep shipments of weapons and supplies going to the Viet Cong. Disembarking with LB was Marshall Lichterman of Alhambra, California, Yeoman 3rd class and ship's postal clerk. When the Maddox called at Wellington, New Zealand in May, a newspaper there, The Dominion, reported that she was named LB for Long Beach, the Maddox's home port, that LB had 15 assorted sweaters for different kinds of weather, two naval uniforms tailor-made for her at Hong Kong, and two polo-neck jerseys for really cold weather. Also, LB had her own miniature lifebelt. She slept in her own bunk. She had her own identification card with pawprints and details of height, length, and weight, her own liberty card, and a service record. Though frightened at first of the Maddox's 10 guns, she became accustomed to them, but she went to the bow if the aft guns were operating, and aft if the forward guns were firing. "Many of the ship's visitors aren't at all interested in the guns or the torpedo tubes," said the New Zealand newspaper. "All they want to see is LB." I don't know where he finished the remaining time. He returned home and married and had two children. My mother was his daughter. He was a crane operator by trade and moved around the country as an employee of numerous construction companies. I know he bought a farm in Trigg County, Kentucky during the 1940's. He lived on part of the farm until his death 05 Jan 1970. I also have a painting of him and another sailor. It is hand painted and measures approximately 18-20 inches tall and 10-12 inches wide. Any information you could find for me would be greatly appreciated and I hope this information will help you fill in the blanks on his service. I have a 14-year old grandson and he is very interested in the Navy. Wonder if it is genetic? I look forward to hearing from you again and if I find any new information in his trunk I will certainly let you know. Again thank you for your time. My name is Paul Barefoot and I live in Colville, Washington. 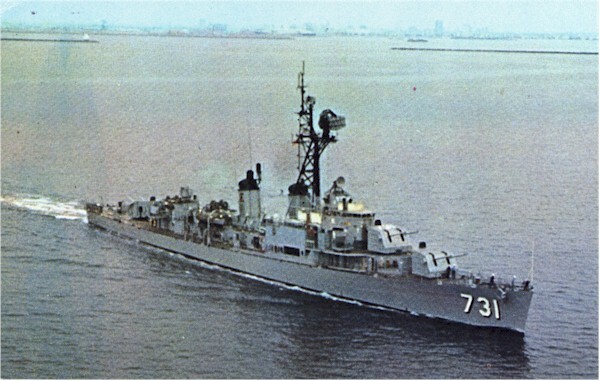 My oldest brother, Edward T. Barefoot was on the Maddox (DD-622). It was sunk in WW II. Is there any possibility that there is anyone in your association that might have been on her that would have known my brother. It was sunk on the coast of Sicily in 1943. I myself was in the Korean War from 1948 to 1952. I was on the USS Mt. McKinley (AGC-7). If you have any info for me, I would appreciate it. Thank you for you time defending our country. The following documents and photos were collected from two sources. 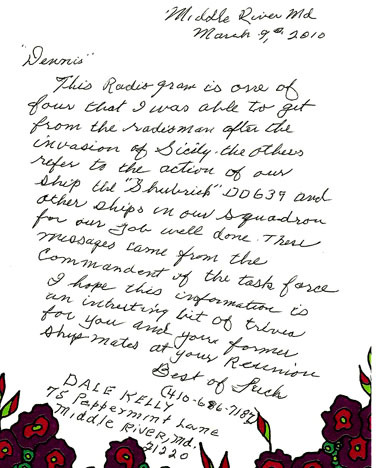 The first set of two documents were sent to Dennis Stokhaug by Dale Kelly who served in USS Shubrick DD-639 in Operation Husky along with Maddox, off the coast of Sicily. 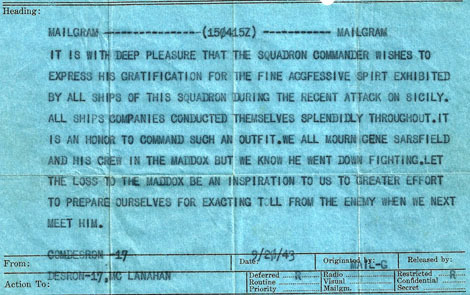 The first document is the letter from Mr. Kelly and the second is from COMDESRON 17 commending the squadron for their performance during the attack on Sicily, and expressing sorrow over the loss of Maddox and Cdr. Gene Sarsfield, the Maddox CO. 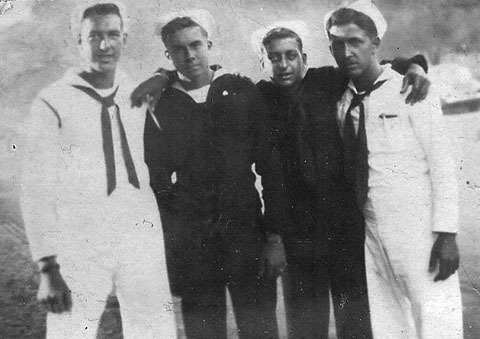 The second set of two documents and one photo were submitted by Rich Pascuzzo, the nephew of Leonard Pascuzzo, who served aboard Maddox in 1946. 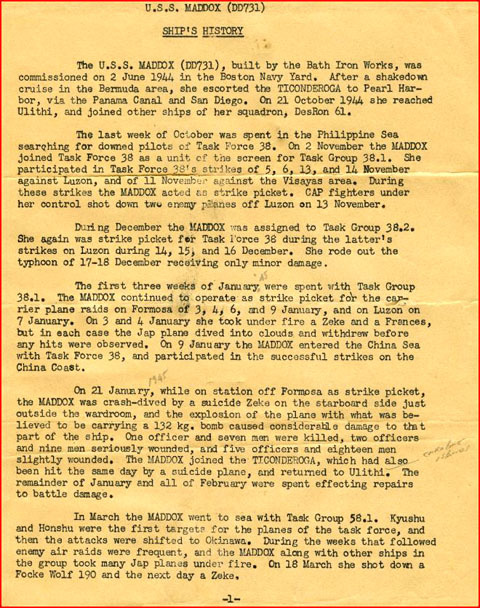 The first document briefly chronicles the Maddox ship's history from commissioning in 1944 through the early part of WWII, including the Kamikaz attack off Formosa. The second document presents the ship's history during the closing few months of WWII. Georger Pink, Anthony Pascucci, Leondard Pascuzzo, and Rayond Pierone - Outside of Bimbo's Cafe. So all you Facebook fans, get out there and it a look. Linebackers of the Sea, by Ray Lubeski. There is an extensive section on the Maddox that might interest all of you. was severely damaged, by a kamaikaze attack. The following web links provide various information and opinions about the Gulf of Tonkin Incident. The Webmaster provides these links for your general interest and does not in any way support, defend, propose, or advance any of these sites as true accounts. Rather they are the opinion of their various authors. They are provided here because of the general interest of our Association members in the topic. Did you serve on more than just Maddox? Interested in other ships' reunions? Then visit the Retired Enlisted Association's website for the latest reunion information. Also check: U.S. Navy Ship Rosters. Depending upon the speed of your connection, downloading these issues could take a couple of minutes. 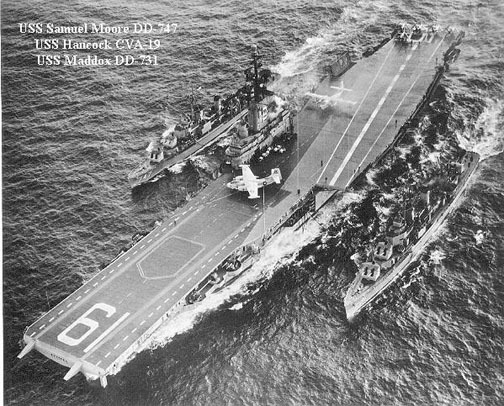 This photo submitted by Don Mettler, the Web Tender for the USS Hannock Association. Don's best guess is that the photo comes from the very early 1960's. The two aircraft midships are either AJ-1 or AJ-2 Savages, which were retired in 1962. Take a look at the USS Hanncock Association website. Here's another new photo sent to me by Roy Hyer. Ron's best guess is that the photo were taken between 1969 and 1972 in Long Beach. The location of the gravesites for veterans and their dependents in VA National Cemeteries, state veterans cemeteries and various other Department of Interior and military cemeteries can be found at the National Gravesite Locatorwebsite maintained by the VA. This site also contains a link to the American Battle Monuments Commission information on service members buried in overseas cemeteries. In addition, their are links to information on burial benefits. To see other information being sought, click on this link: Looking for Shipmates. 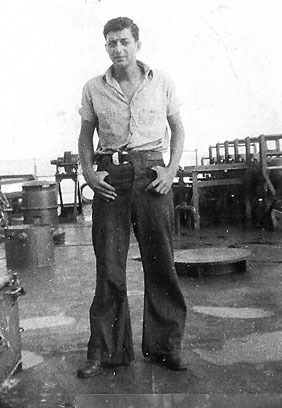 I received word that a shipmate, Leonard Dominic Pascuzzo, FC3, who served aboard in 1946 passed away in 1989. If any of you oldtimers remember him, you might drop his nephew Richard a line at richpascuzzo@verizon.net. Here's a photo of Leonard on the fantail from those days. 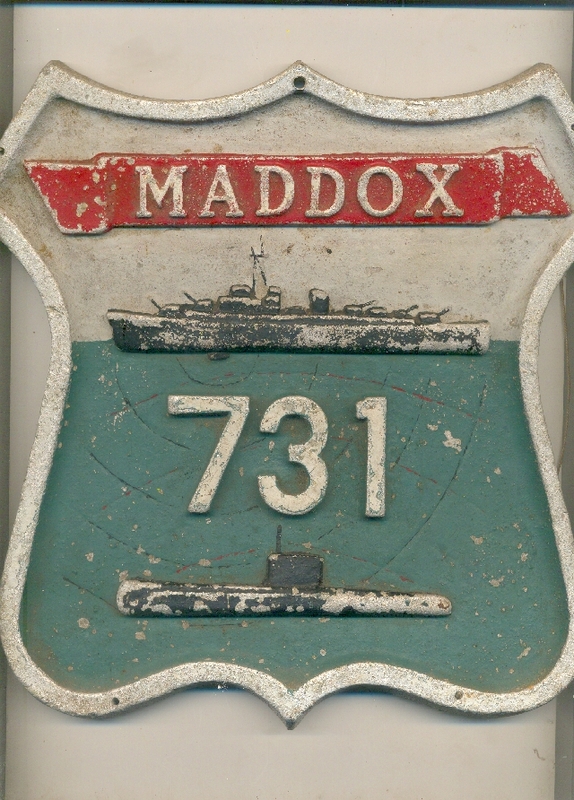 For a history of the three ships to bear the name, USS Maddox, click on History. DD-622; Missing-in-Action status changed. 210 Officers and Enlisted Men declared Killed-in-Action. Read the findings and other related letters. This photo was sent to me by Scott Martin BT3, the webmaster for USS DeHaven (DD-727). It was taken by one of the DeHaven crew, Dave Anderson. Thanks a lot Dave, we really appreciate the fine photo. These photos were sent to me by Dorman McGinty, who was a RM2 stationed at Cincpacflt in Hawaii. This photo shows the Maddox preparing to go alongside. Look up your shipmates. The lists carry information about our shipmates, both members of the Association, and those who are not, but that we have information about. 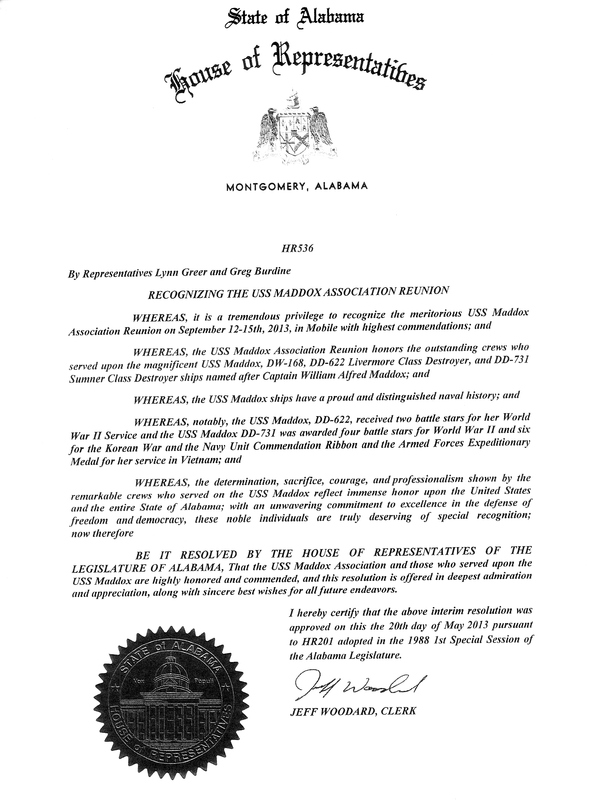 If a shipmate is deceased, and their wife is a member of the Association, then I have included the name and addresses of the wife and have indicated that they are the member. If this is your first visit to this page of all shipmates who have served on the DD-128, DD-622 and DD-731, please take the time to first carefully review your own listing. If your listing is incorrect, or your name does not appear in the list, please register. Please let me know what I can do to improve the lists or make them more useful for you. There are likely errors in the attached lists of shipmates. Please review your listing carefully and submit any changes to me at: Shipmates Listing. 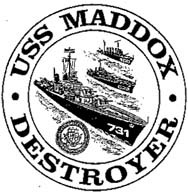 Here are links to web sites dealing with various aspect of USS MADDOX and destroyers. USS Maddox, Naval Art - Note: As so many of you have pointed out, this is not USS Maddox, but a Fram destroyer. For the price, the artist should have gotten it correct.